Both computing terms have identical functions, and as a matter of fact, experts say all servers work as hosts, but not all hosts are considered servers. Let’s find out why. Any network device connected to other devices via the Internet. Any computer hardware or software that can provide various services to other devices. Requires the Internet for interconnection. Can work on both LAN and Internet connections. Can share and consume resources. Can only share resources and services. A host, or a network host, is either a piece of computer hardware or any device connected to a computer network. It is assigned a unique IP address and can serve as a source of information, services, and applications that can be accessed by other users’ machines, otherwise known as remote terminals. A computer that connects to the Internet via an Internet service provider is also considered a host, specifically when Point-to-Point Protocol (PPP) is used to initiate the network connection. In this scenario, the computer is assigned an IP address as soon as the connection to the network is started. Thus, the home computer serves as a host for that connection. A network host is considered a physical network node, or simply a device connected to a network. However, not all networked devices are referred to as hosts. For instance, network devices including hubs, modems, and network switches do not have host addresses, so they are not referred to as network hosts. While appliances such as network printers and routers do have IP addresses, their function is specific and not general in nature, thus not fitting the definition of a host as a general-purpose device. A server can be hardware or software that provides functionalities or services for other devices or computer programs. These devices and computer programs are called “clients” in the client-server model. Data and resource sharing and performing computations are some of the services a server can provide to one or multiple clients. A single server can have several clients connected to it, and a single client can connect to several servers. 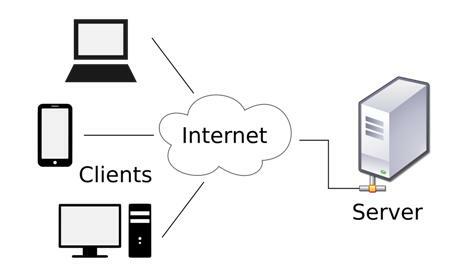 It is possible to run a client and a server on the same device, or the device can connect to a server using a different network connection. Common examples of servers are file servers, application servers, database servers, email servers, and game servers. A client-server system works with a client sending a request to the server. The server in turn processes the request, after which an acknowledgement or result is sent back. A computer designated specifically as “server-class hardware” is usually called a dedicated server. A dedicated server is usually more powerful and durable than personal computers. The Internet is based upon this client-server model with the exception of P2P, or peer-to-peer file sharing, and some telephone applications such as Skype. Millions of servers running continuously are connected to the Internet. Each mouse click by an Internet user anywhere in the world translates to interactions with a single or multiple servers at any given point in time. Servers can be one or two personal computers in someone’s basement, or hundreds of sophisticated, powerful computers housed in data centers. So what’s the difference between a host and a server? As mentioned earlier, servers can be host computers, but not all hosts can be considered servers. A network host is any computer hardware or device connected to a network via the Internet. A server, on the other hand, can be a computer program or hardware that “serves” functionalities that other devices connected to it can access through the client-server model. A server can be connected to other computers using a local area connection or the Internet. In contrast, a host can only be connected to other computers using an Internet connection. Network hosts can share as well as consume resources with other interconnected nodes or devices, while a server’s sole purpose is to share information, programs, and resources with other computers or devices connected to it.